Austria, the home of composers like Mozart, Haydn and Strauss, offers travelers something to sing and dance about year round. So it makes sense that the classic movie The Sound of Music was filmed in Austria. Austria is a mostly mountainous country in the centre of Europe with spectacular landscapes, from rugged mountains to plains dotted with lakes. The Alps draw many travelers to Austria, for winter sports in the winter, and hiking, mountain biking or climbing during the summer months. Meanwhile Austria’s cities like Vienna, Salzburg and Innsbruck offer modern sophistication coupled with stunning period architecture. Austria is cold in winter with temperatures often below freezing and the ski season lasts from late December until March. In summer the temperature can range from 20 to 30°C with the wild alpine flowers are in full bloom in July. So where do you get started when you travel to Austria? Austria’s capital Vienna is the perfect mix of old and new. The regal boulevards, parks and palaces give it an instant grandeur that’s in keeping with its over the top baroque interiors. Rich in history, travelers to Vienna can wander between grand imperial palaces, magnificent squares and impressive museums. The Hofburg where the Habsburgs ruled remains top of the to do list. Near the Hofburg the Museumsquartier houses some of the world’s finest examples of contemporary art behind its striking basalt façade. This is the best place to come to eat, drink and people watch. The Danube River flows by to the east of Vienna’s historical center and the Winerwald (Vienna Woods) on Vienna’s western border are great for walking or mountain biking as well as being a well known wine growing region. setting for the classic 1959 movie The Sound of Music starring Julie Andrews and Christoper Plummer. Fans of the movie can take a bus tour of the city and nearby St. Gilgen and Lake Wolfgang where you’ll find the rolling hills behind the opening credits of the movie. Find out more about where to visit and what parts of the movie were shot where on the Visit Salzburg website which has pointers on visiting the Nonnberg Nunnery (where the nuns sing “Maria”), Mirabell Castle and Mirabell Gardens (where Maria and the children sing “Do-Re-Mi”), and the Felsenreitschule and Festival Halls (where the Trapps perform during the Salzburg Festival). Salzburg’s tourism office also recommends The Sound of Music locations on their website including St. Peter’s Cemetery and Leopoldskron Palace. Zell am See is a beautiful town by an Alpine lake in the Pinzgau region of Salzburg. With spectacular views and a picturesque setting it offers great skiing in winter at resorts like Saalbach-Hinterglemm, the Kitzsteinhorn or Kaprun. Even when the weather warms up the nearby glacier on the Kitzsteinhorn offers the best summer skiing in Austria. In summer, travelers to Zell am See can go walking in the National Park Hohe Tauern. The Zeller See Lake is good for swimming while the less active can take a boat cruise across the lake or explore further afield on the ferry to Thumersbach. Zell am See has been a market town since 1358 and its historic city centre, with a Medieval tower and a Gothic parish church, add to Zell am See’s unique appeal. Be sure to wander round town to see the old buildings like the Grand Hotel of Zell am See, which dates back to the fin-de-siecle area, and walk along the lakeside promenade. For history buffs the Heimatmuseum (town museum) covers the history of Zell am See and the Pinzgau region, as well pagan traditions in the alpine regions of Salzburg including Perchten. Fuschl am See is a beautiful Austrian village by tranquil Lake Fuschl. Surrounded by pine clad hills and gentle mountains, swimming or rowing in the lake’s cool clear water is refreshing during the summer and utter peace is guaranteed as no motor boats are allowed. Popular walks include the village centre, woodland strolls and the lakeside path. Fuschl am See makes a great base to explore the Austrian Lakes region. St. Gilgen is only six kilometers (four miles away) and from there you can enjoy a boat trip on Lake Wolfgang or ride the gondola up the Zwölferhorn. Just two kilometers (three miles) from Innsbruck, the capital of Tyrol, Igls overlooks the impressive Nordkette peaks and is surrounded by woods and meadows that seem to be taken straight out of The Sound of Music or a Heidi book. Being so close to Innsbruck you can easily visit museums, art galleries, the Hofburg Palace or the Golden Roof as well as many other attractions. Regular buses run between Igls and Innsbruck or there’s a small tram that descends through meadows and forests to the valley below. In Igls itself you can poke around dinky village shops or take a cable-car ride up Patscherkofel for stunning alpine views. Day trips over the borders to Neuschwanstein Castle in Bavaria or Merano in Italy are also easily organised. So if you’d like to see some gorgeous alpine scenery, beautiful cities and quaint villages then take a trip to Austria and visit some of these places. It’s definitely something to sing and dance about. 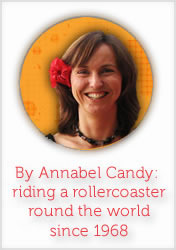 This is a sponsored blog post by Inghams, one of the UK’s leading specialist tour operators. To find holidays in Austria with Inghams visit their website and see what takes your fancy. Have you ever traveled to Austria or would you like to? Thanks for sharing this blog post. I absolutely love Austria – it is one of my favourite European countries – and I highly recommend it to anyone visiting Europe. Zell am See is fabulous – I’ve written about it on my website as my family and I have spent lots of great holidays there – and I also enjoy visiting Salzburg and the Innsbruck area. Like Igls, Natters is another lovely little village only a few kilometres from Innsbruck. Unfortunately I haven’t made it Vienna yet – that’s pencilled in for the next European visit. I’m also planninng to do a cycling trip around the Austrian lakes in the Salzburg/Hallstatt region next year, which I’m really looking forward to! If any of your readers are heading to Europe, I encourage them to include Austria in their itinerary. I made a quick visit to Austria when I lived in London. It’s a great country. I stayed in Graz which is a little university town as I was visiting a friend who was married to an Austrian. Graz is a gorgeous wee town that’s probably not on the tourist trail but well worth a visit. That’s a good tip. I didn’t write about the food here but I remember having gluwein and cheese fondue when I was there. I was 14 or 15 and visiting on a school ski trip! I have heard good travel stories about Austria. Never been there, but I would definitely consider visiting and follow your list. Austria was one of the first European countries I went to and I remember being amazed at the mountains, the chocolate and the cherry brandy. Well, I was only 16. I would so love to go there again as an adult, especially with the older kids, that would be a huge treat! Next of my list is Austria. I would love to see all these places you’ve listed here!! !